Mohai, P. and Bryant, B. 1992. Racial Differences in the Perception of Most Important Environmental Problems. Paper submitted for consideration for presentation at the 1992. Meeting of the American Sociological Association. in progress. Bryant, B. 1995. Pollution Prevention and Participatory Research as Methodology for Environmental Justice. Virginia Environmental Law Review. (To be published in December, 1995). Mohai, P. and Bryant, B. 1992. Environmental Injustice: Weighing Race and Class as Factors in the Distribution of Environmental Hazards. University of Colorado Law Review. Vol. 63(4). Bryant, B. 1992. Toward a Curriculum for Environmental Programs. The Environmental Professional. Vol. 14(4) 293-301. Bryant, B. 1995. Environmental Advocacy, Justice, and Sustainability. Manuscript has been finished. Presently being reviewed by Island Press. Bryant, B. and Mohai, P.(Eds.) 1992. 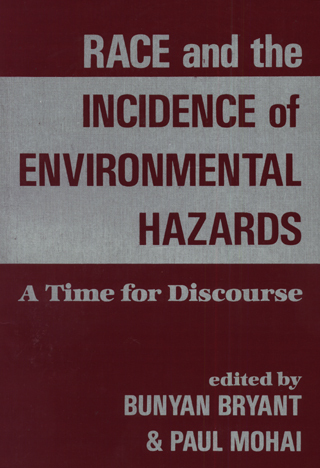 Race and the Incidence of Environmental Hazards: A Time for Discourse. Boulder, Colorado: Westview Press. Bryant. B. (Ed.) 1995. 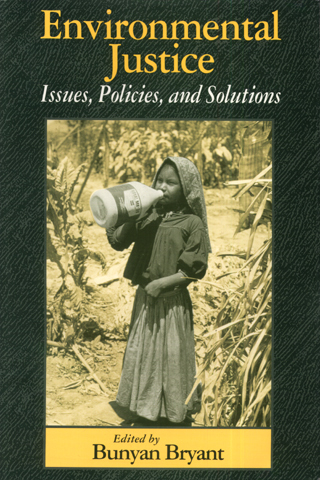 Environmental Justice: Issues, Policies and Solutions. Washington, D.C.: Island Press. Bryant, B. 1993. The 1988 Presidential Campaign and Multicultural Education. Schoem, D. et al. (Eds.). Multicultural Teaching in the University Westport, CT.: Praeger Publishers. 147-	158. Bryant, B. 1994. Small Groups and Organizations for Healing the Planet. In draft stage to be submitted for publication during the winter of 1996. Bryant, B. and Jones, A. 1993. Seeking Effective Schools for African American Children, San Francisco: Caddo Gap Press. Bryant, B. 1993. The Future: Images for the 21st Century. Ann Arbor: Office of the Vice Provost for Minority Affairs. Bryant, B. and Mohai, P. 1991. Environmental Racism: Issues and Dilemmas. Ann Arbor: University of Michigan Office of Minority Affairs: 1-70. Bryant, B. 1995. Rehearsing the Future, In Context: A Journal of Hope, Sustainability and Change. No. 40, Spring 39-40. Bryant, B. et. al. 1994. Symposium on Health Research and Needs to Ensure Environmental Justice. Executive Summary and Proceedings. Crystal Gateway Marriott Hotel, Arlington, VA.	A Federal Advisory Committee. 1994. Proceedings of the National Environmental Justice Advisory Council Meeting. Washington, D.C.: Omni Shoreham Hotel. Bryant, B. et. al. 1994. Symposium on Health Research and Needs to Ensure Environmental Justice. Recommendations. Crystal Gateway Marriott Hotel, Arlington, VA.
Bryant, B. 1993. Detroit Summer: A Model for Service Learning. In Howard, J. (Ed.) Praxis I: A Faculty Corebook on Community Service Learning. Ann Arbor, Michigan. The OCSL Press. 67-75. Bryant, B. 1993. Racism: A Toxic Waste. Against the Current. Vol. 7(6): 10-12. Bryant, B. and Weahkie, L. 1992. Education and Youth. In Lee, C. (Ed.) Proceedings: The First National People of Color Environmental Leadership Summit. New York: United Church of Christ Commission for Racial Justice. 165-170. Bryant, B. and Mohai, P. 1992. The Michigan Conference: A Turning Point. EPA Journal March/April. Vol. 18(1) 9-10. Bryant, B. and Mohai, P. 1992. Environmental Racism: Wasting Communities of Color. Prairie Journal. Vol. 3(1), Spring. 16-17. Mohai, P. and Bryant, B. 1992. Race, Poverty, and the Environment. EPA Journal March/April. Vol. 18(1) 6-8. Mohai, P. and Bryant, B. 1992. Environmental Racism: Reviewing the Evidence. Paper delivered at the University of Michigan Law Symposium on Race, Poverty, and the Environment. Ann Arbor, January. 1-20. Bryant, B. et al. 1992. Review of the EPA Environmental Equity Workgroup Report. In Environmental Equity: Reducing Risk for All Communities. Vol. 2. Washington, D. C.: United States Environmental Protection Agency. Policy, Planning, and Evaluation (PM-221) EPA230-R-92-008A June. 81-87. Bryant, B. and Mohai, P. (Eds.) 1990. The Proceedings of the Michigan Conference on Race and the Incidence of Environmental Hazards. Ann Arbor: University of Michigan School of Natural Resources. Bryant, B. 1990. A Social and Environmental Change: A Manual for Organizing. San Francisco: Caddo Gap Press. 1-78.